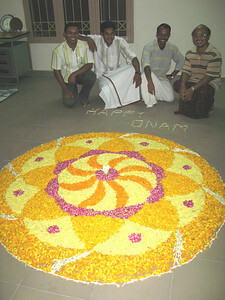 The evening before, several students spent many hours arranging flour petals. The special meal is vegetarian. It is served on banana leaves. 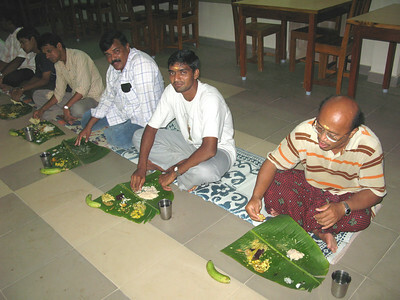 Guests eat the meal with their fingers, which is normal in India. Fr. Charlie (USA) sitting, Indian style. Fr. Spigniew, sitting Indian style. ....for a while. 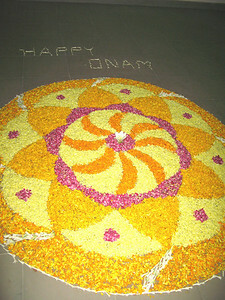 It is very difficult to sit Indian style for a long time. Those who prepared the meal, and served it, will eat at a later time.